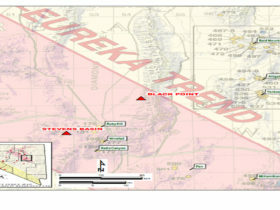 The project consists of 14 claims located on the west flank of the Diamond Mountains twelve miles north of Eureka, Nevada and just west of White Pine County. 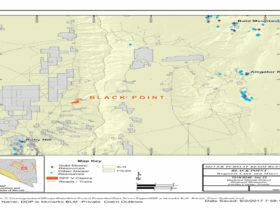 Black Point is located 18 miles west of the Bald Mountain mining district and 11 miles northeast of the Eureka mining district. The nearest mine with notable metals production is the Diamond (Philipsburg) mine where lead and silver (with a minor gold credit) were produced from structures in Silurian-age dolomite. 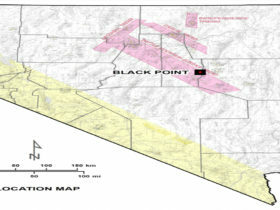 Black Point is five miles south of the Diamond mine. The property is accessible by pavement and graded dirt, for eleven miles north of Eureka then on unimproved dirt road three miles east. Elevations range from 6000 to 7600 feet (1800-2300 m) in the area. Disseminated gold hosted in the near-surface by Paleozoic sedimentary rocks. Of primary interest is the Pilot Shale of Devonian/Mississippian age that hosts gold mineralization in the Alligator Ridge deposit of the Bald Mountain District mining district. Gold mineralization at Alligator Ridge is associated with silicification that ranges in character from subtle carbonate removal (sanding) to pervasive silica-flooding (jasperoid). The hydrothermal fluids are thought to have been channeled along deep-seated normal faults, then episodically pulsed along the bedding between the Pilot Shale and the underlying Devil’s Gate limestone. Higher gold grades tended to be present along the contact between Pilot and Devils Gate where intersecting the normal faults. 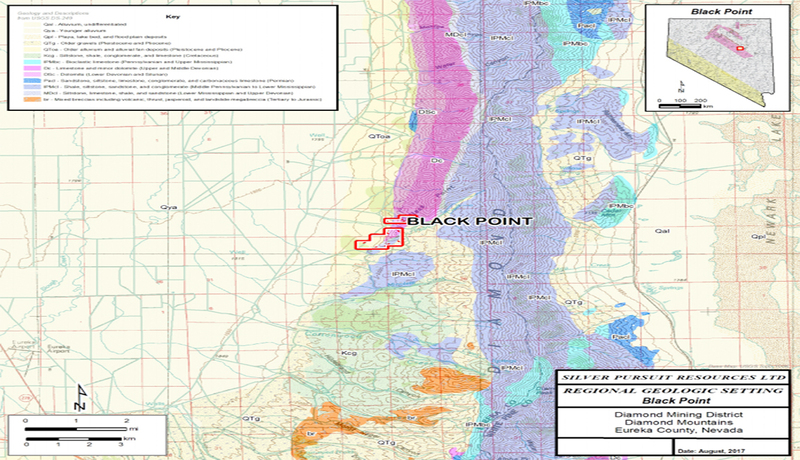 At Black Point, normal faulting appears to have reactivated shear zones with fault imbrication and silica-flooding. 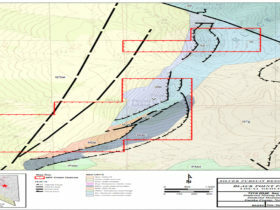 The downdip projection of the structural zones that include masses of jasperoid and silicified Pilot Shale are important targets to be drill-tested at the property. 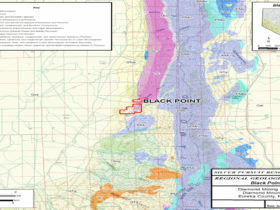 Numerous, small local mines have had underground operations at Black Point. 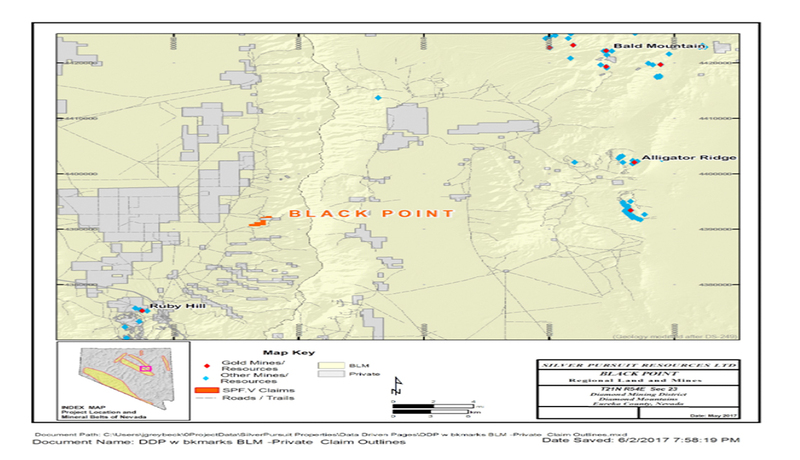 Reports included in the NBMG district files provide details of production and exploration efforts for silver resources at the Philipsburg mine as well as several other prospects near the Black Point Project. 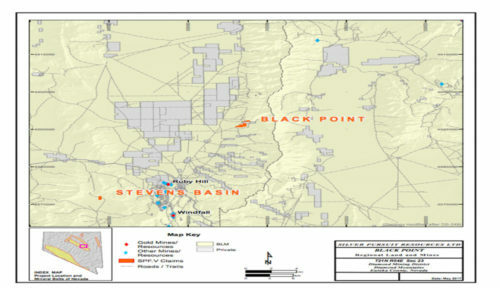 Historically, several drilling efforts were undertaken. Gold values were not included in the assays results of the drilling. The reports suggest there may be zoning in the mineralizing system. Logs also indicate that the Pilot Shale is present in a few of the drill holes completed in the 1950’s and the 1970’s. dipping to overturned. Near the Black Point claims, the structure is more complicated with imbrications in the thrust sheets related to late Paleozoic deformation. The older deformation is thought to have provided conduits to the hydrothermal systems that deposited the precious metals in the Diamond mining district. 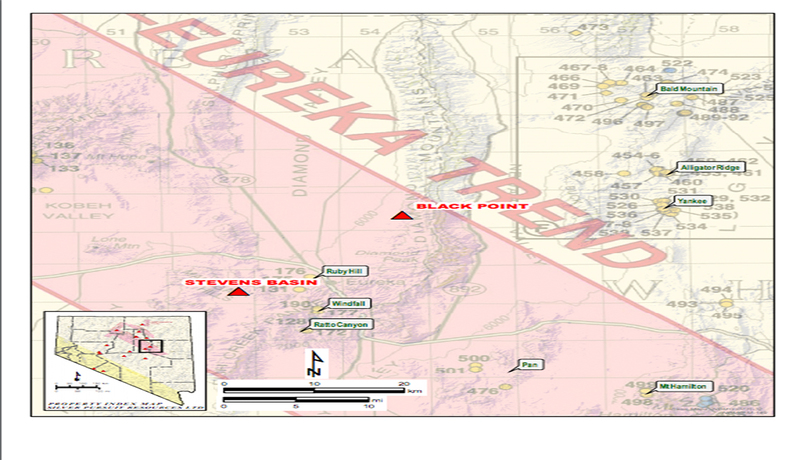 Regionally, the structural geology of the Diamond Mountains includes northwest-trending belts with steep dips. Seven miles north of Black Point the beds are overturned to the east but to the south, the beds are noted to have more open folds. High-angle, reverse faults are interpreted to be parallel to the folds. The historic underground workings at Black Point were developed in zones of massive silicification of carbonate rocks. The alteration is often so pervasive that the original lithology of the host unit is obliterated. 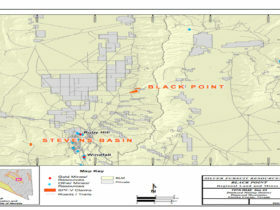 Results of recent sampling efforts have identified breccia zones that contain white, broken barite as a constituent of mineralized Pilot Shale. Silver values in excess of 100 opt Ag is present in the massively silicified Paleozoic rocks at Black Point workings. 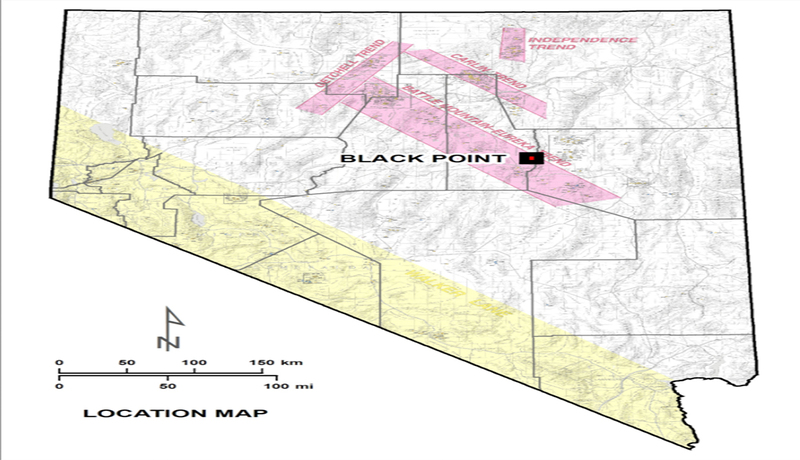 Detailed mapping and systematic surface sampling will provide an understanding the potential of a gold zone lateral to the more silver-rich mineralization that was the emphasis of previous mining activities in the area. 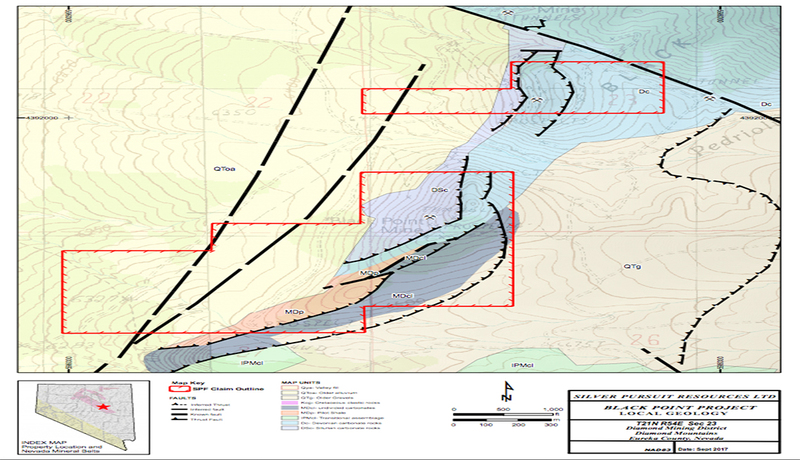 Additionally, sampling and mapping will be used to develop potential drill targets along the projection of the more favorable host rocks as well as the structures that are believed to be the mineralizing conduits (feeder zones) to the precious metals system.